Onebornfree's 9/11 Research Review: 9/11 Scams: Alexander "Ace" Baker Versus "Armageddon"
9/11 Scams: Alexander "Ace" Baker Versus "Armageddon"
WTC Tower collapse 09/11/01 A [faked] movie building collapse, 1998. This post was prompted by a recent short, but very revealing quote [see above] from an email exchange I had with Alexander "Ace"Baker [aka Colin Alexander] because we both are apparently on the same 9/11 e-mail group list somehow [I'm not even sure how I even got on the list ]. Our own brief "obf/Baker" message exchange was prompted by an e-mail group discussion of a series of still photos that both himself and others defend, claiming the photo series depicts "steel turning to dust". I first came across the 9/11 research of one "Ace" Baker in around 2007, when I was first exposed to his analysis of the still controversial "live" Fox5 TV broadcast that appeared to show Fl.175 [ie the 2nd 9/11 plane], penetrating, and then emerging, nose-cone still miraculously intact, on the opposite side of WTC 2. Mr Bakers original frame by frame analysis of that Fox5 sequence can still be viewed here [although I could not get the frame advance button to work for me]. Although Mr Baker appears to share similar beliefs to myself as regards both economic and political theory [ broadly: "anarcho/ Austrian/libertarian"] , and we both seem to share the belief that the government is nothing more than a 100% criminal scam, [ whereas, as far as I can see, 99+ % of 9/11 and "conspiracy" researchers in general appear to be rabid, "foaming at the mouth", apologists for the state], and besides the fact that he is one of only two other persons involved in 9/11 research that appear to be on anything like the same page as myself with regard to both economic and political philosophy concerns, unfortunately, my comments and conclusions addressing Mr Baker's 9/11 research to date are almost entirely negative here. My apologies to Mr Baker, but still, in the interests of honesty, my negativity towards his research was, in the end, unavoidable, as far as I can see. Baker's Current 9/11 Beliefs = Plane Images Were Inserted Into Otherwise Live 9/11 Broadcast "Feeds"
From that Fox5 analysis and others similar, Mr Baker concluded that all of the imagery showing a plane flying into WTC2 was in fact deliberately altered - however, he believed, [and still does to this day, that an image of a plane silhouette was "merely" inserted into what was otherwise genuine live MSM broadcast imagery on 9/11. Video "Expert" Baker Believes The 9/11 Televised Destructions of WTC1, 2 and 7 Were Genuine Live Broadcasts. Despite Mr Baker's "plane image inserts into live feeds" theory, which I would think would naturally lead an investigator to at least very seriously question the veracity of any/all of the rest of the alleged live TV 9/11 broadcast imagery- he [surprisingly, to me, anyway], apparently unquestioningly trusts the genuineness of the rest of the alleged live 9/11 broadcast imagery, [as revealed by his quote], and therefor believes that the videos and photos of 9/11 that depict the WTC buildings [e.g.WTC1, 2 and 7] collapsing or exploding [or whatever you wish to call it] , including the "steel to dust" sequence under discussion [see Fig1 above] are all genuine, and that they therefor depict some type of nuclear demolition process, although I'm not exactly sure whether he supports the mini-nuke hypothesis, or something else ["maxi-nukes" perchance? :-)]. Although Mr Bakers 9/11 conclusions at first made some sense to me way back when , they no longer do so, for many reasons, for whatever _that's_ worth. Mr Baker claims to be an "expert" videographer, and to have produced the more recent production "9/11 - The Great American Psy-Opera", by himself, as proof of his own videography expertise. However, based on his conclusions to date, plus his more recent quote, it seems to me that there are serious questions to be asked as to his supposed ability to closely analyze _any_ of the alleged 9/11 imagery, including the so-called "steel to dust" sequence mentioned/linked to above that had prompted our recent [Dec.2014.] , brief email "discussion". Provenance Fact  : The"Steel To Dust" Sequence is NOT Original "Live" MSM 9/11 Footage! It is worth remembering [at least for a serious researcher, methinks ], that the "steel to dust" sequence is NOT original , broadcast as live, MSM 9/11 footage as archived on line. It has absolutely nothing at all to do with the original, as archived MSM "live" footage record. 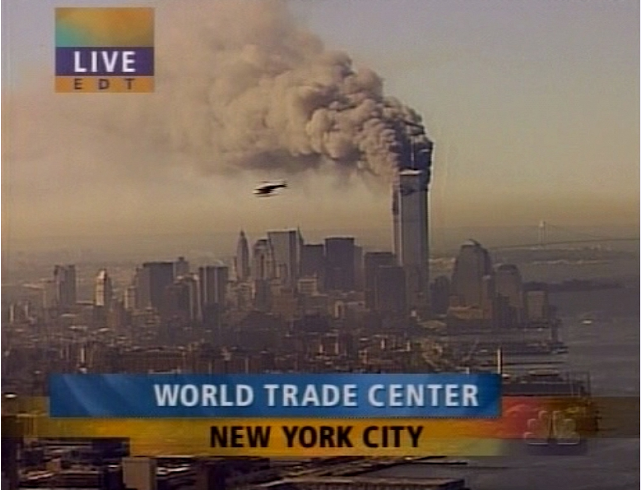 It is, in fact of an entirely different provenance , never broadcast as live footage that day [9/11] . N.I.S.T. [National Institute of Science & Technology] Origins? The "steel to dust" sequence under discussion, just like the vast majority of ALL 9/11 imagery, was released some time later. [ I'm assuming , for now, without back-checking, that it was a part of the mysterious, enormous, 9 years later, 2010 N.I.S.T. imagery "dump" onto the internet, although it may possibly originate from an earlier "dump" in 2007]. Which means that the provenance of the "steel to dust" sequence is unknown, or at the very least, highly dubious. [Please see 6 provenance questions listed below]. 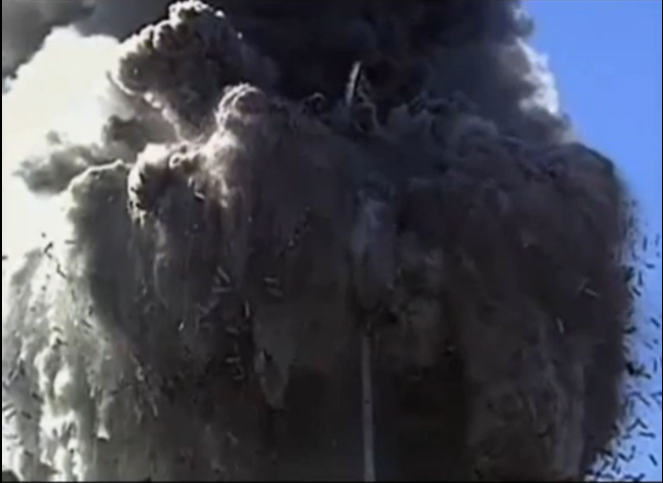 Original "live" footage of the two tower "collapses" that was broadcast "live" as they happened, is scarce. Most 9/11 researchers [including Mr Baker, apparently] appear to be entirely unaware of this very important fact, and appear to spend their time analyzing video and photographs that are not a part of the official on-line archived video record, and never have been. On checking the on-line archives for the original MSM coverage at the alleged collapse times [ 9:58 am EST for WTC2, and 10:28 am for WTC1], unless I missed one [ possible, I'm not infallible] it appears that only two complete top to bottom "live" collapse sequences by the "big 5" national stations [CBS,CNN, ABC, Fox, NBC], were first broadcast "live" at those exact same times [ie. 9:58 am EST and 10:28 am EST]. 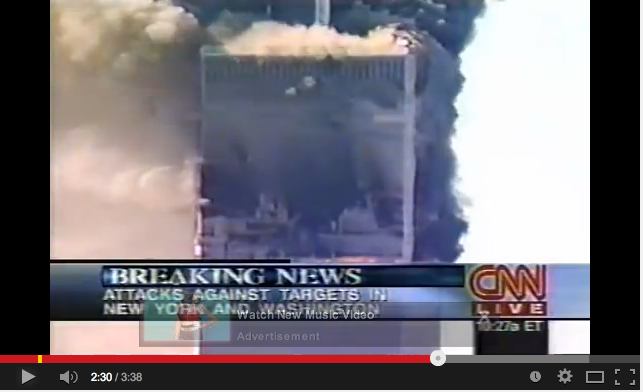 That is : NBC showed the entire WTC2 collapse at 9:58 am, and CNN showed the entire WTC1 collapse at 10.28 am. 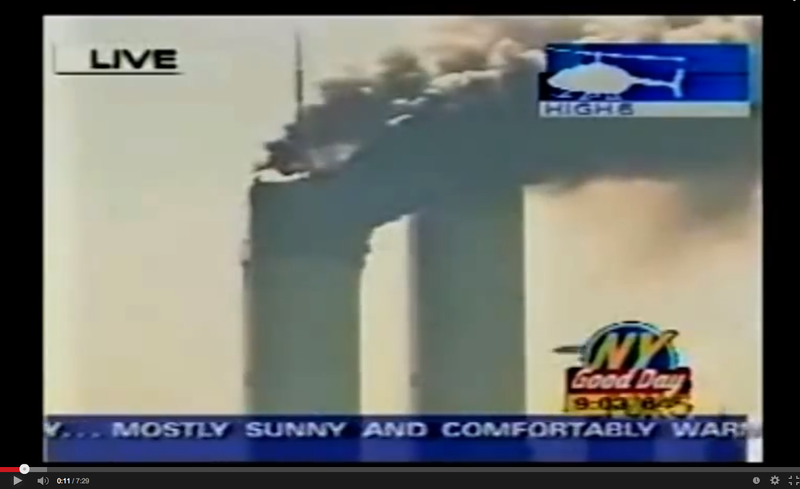 The rest of the supposed live MSM broadcasts for that day showing WTC1 and 2 tower collapses appear to be "earlier today" type, non-live re-caps, _not_ live "as it happened" broadcasts. 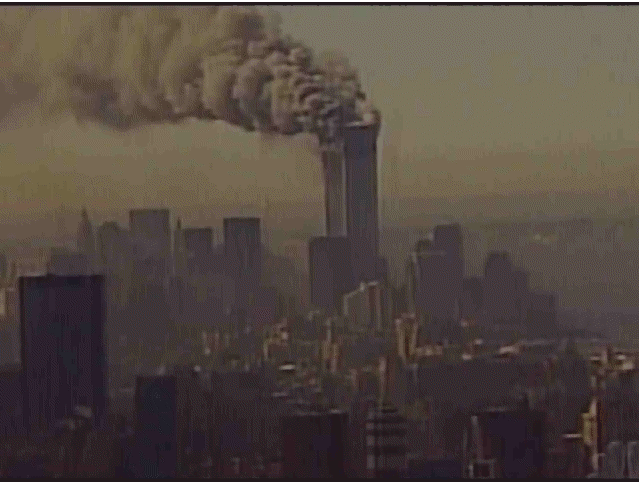 Click here to see the only two original allegedly live, complete, MSM top to bottom tower collapse broadcasts [WTC2 @ 9.58 am and WTC1@ 10.28 am], that I have been able to find in the archived footage for all 5 US MSM networks for 9/11 to date . 1] Exactly who shot the "steel to dust" sequence under discussion? 2], Exactly where were they situated? 3] Exactly what camera equipment was used? 4] Has a complete in-depth, private investigator-type background investigation of the alleged photographer ever been undertaken, including financial and bank records etc.? 5] Has a thorough technical analysis [frame by frame if a video], been performed , looking for specific "giveaways" for faked imagery [Assuming the investigator knows what to look for]? While the provenance of fully 99.9% of the alleged 9/11 imagery is dubious, uncertain, and appeared in all its glory _after_ 9/11, the provenance of all of the archived, on line, original "live" "as it happened" network footage [what little there is], is very clear. So What's The Big Deal About Provenance? Why do I believe that provenance issues are important when analyzing 9/11 imagery? My point is [ I hope], easy to understand. To whit: if it could be shown that all of the original MSM "live" broadcast, on-line archived footage, including the sequences showing both plane crashes and tower collapses, is not genuine live video but only crude, computer generated CGI imagery, then why would any honest, serious 9/11 investigator, in light of that new fact, simply go right ahead and then assume that a later released [ie never shown live on TV as it happened] photo or video depicting the exact same event , but supposedly showing it "in more detail" [eg the "steel to dust" sequence that started this whole e-mail group discussion], was original and genuine, without performing all of the first 5 provenance tests briefly described above? Again, it beats me :-) . The unfortunate fact of the matter is that 99% of claimed 9/11 researchers , including Mr Baker, it appears, are quite happy to avoid dealing with issues of imagery provenance, or prefer to deal with it superficially - that is, assuming they even know, or care, what it is. Remember, the Youtube clip above is from a Hollywood movie released five years before the events of 9/11, and that as regards computer software and technology advancements, Moore's Law states that : "over the history of computing hardware, the number of transistors in a dense integrated circuit doubles approximately every two years." Meaning that because of ongoing technological innovation, computer power and capabilities effectively doubles about every two years. Fig. 2: Had too much to drink? Are we seeing double yet? [And "dig" the squared smoke patterns to the right of the North tower antenna :-) ]. Fig.3: X-Ray vision, anyone? 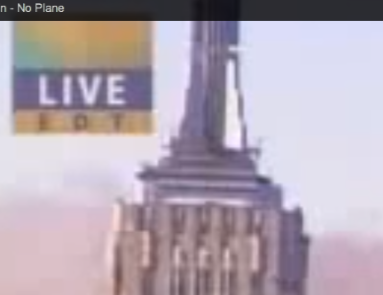 See through buildings?Is that a see-through spire seen above in this detail from a 9/11 live MSM broadcast? Or are you going to dismiss it as a sunlight reflection? "over the history of computing hardware, the number of transistors in a dense integrated circuit doubles approximately every two years." Fig 4: Real enough for ya yet? 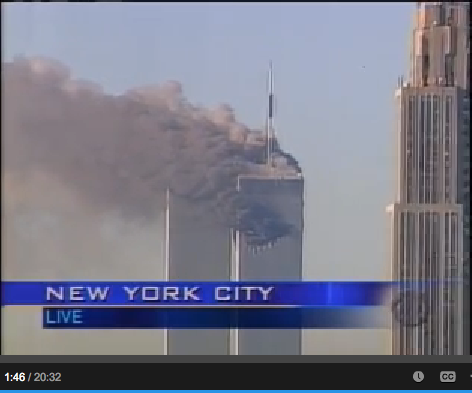 A still frame from NBC's original live 9/11 broadcasts [just prior to WTC2's er, "collapse" at 9:58 am. ]For complete original collapse sequence go here. Fig.5: Real enough for ya? 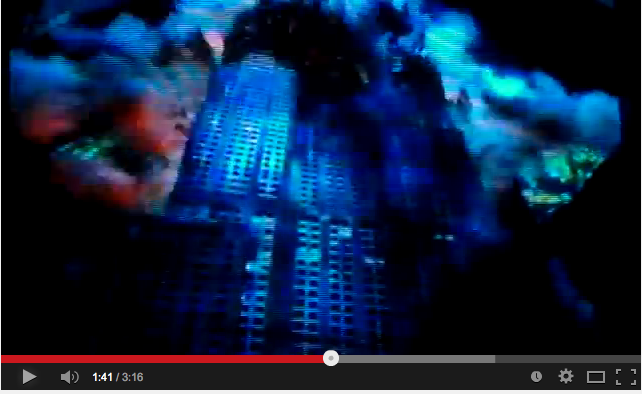 A still frame from CNNS's original live 9/11 broadcast of the er, "collapse" of WTC1 at 10:28 am. For complete sequence go here. "Steel to dust" - Take a good hard look- Honestly now, does this 2001 image really depict a higher level of realism than can be seen in say, 1998's "Armageddon"? Seriously? Q: Now I ask you, Mr Baker [and other true, died-in -the-wool "plane insert only" and "steel to dust","the collapse footage is all genuine" believers] , are you seriously still suggesting that the only fake part of this image, is the plane nose image [left of "NY Good Day"] itself ? You are kidding, right? ;-) . How does the "level of realism depicted " in that Fox image still compare to the "level of realism depicted " in, for example the 1998 movie Armageddon? Huh? Mr Baker- Genuine Video Expert, Or Something Else? 1] As a claimed "video expert", why was/is he _still_unaware of the level of computer technology available to produce 100% computer generated [CGI] simulated building collapse scenes in major Hollywood movies from more than 15 years ago, while non-video experts [e.g. myself] are fully aware of the level of that pre-9/11 computer technology? 2] Why is he, like most other claimed "9/11 researchers" apparently entirely unaware of, [or choosing to conveniently ignore], just about all of the original, on-line archived 9/11 live broadcast TV records and the collapse of WTC1 and 2 as depicted in that original, archived 9/11 footage? Mr Baker appears to be either a very poor video expert , since to this day[Dec. 2014] he remains entirely unaware of the true technological capabilities of CGI software that was in use in Hollywood more than 15 years ago , and claims that "Animating the demolition videos to the level of realism depicted is impossible, even with 2014 technology." , or, he is something else entirely. That final choice of what Mr Baker is, and is not, is yours to make, dear reader. "Why Jim Fetzer /Richard Hall/Ace Baker etc. Are Wrong About This Fl.175 Video [Hezarkhani]"
" 9/11 Scams:The Faked "Live" CNN WTC1 Collapse Footage"
"9/11 Scams: Real N.Y.C. Images Vs. 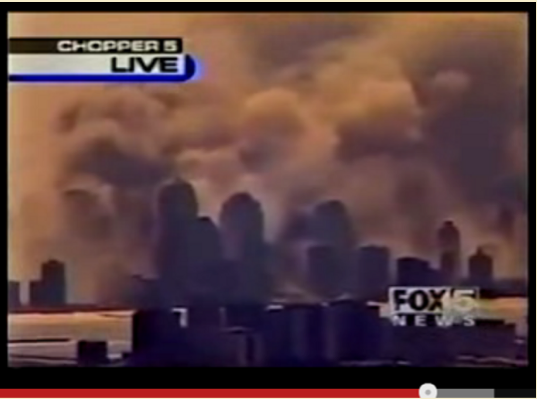 Fake MSM 9/11 Media Broadcast Footage- Random Examples. " "Two Original, Complete, Top To Bottom "Live" MSM WTC1&2 Collapse Sequences "
Labels: 9/11 evidentiary methodologies, 9/11 media fakery, 9/11 MSM Video fakery, 9/11 Scams, Ace Baker, Alexander "Ace" Baker Versus "Armageddon"
1. 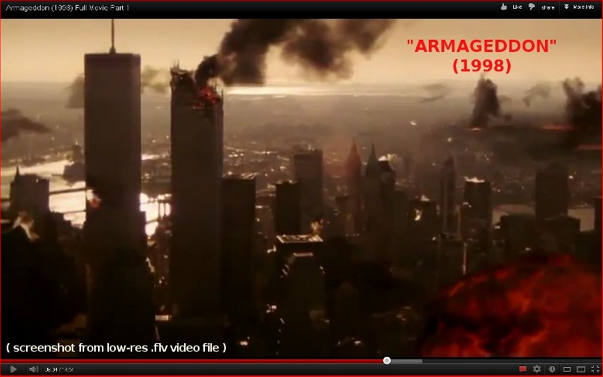 Armageddon begins with live action footage, only the destruction and explosion FX are composited in. The "Total Animation" ops ("Simon Shack" et. al.) 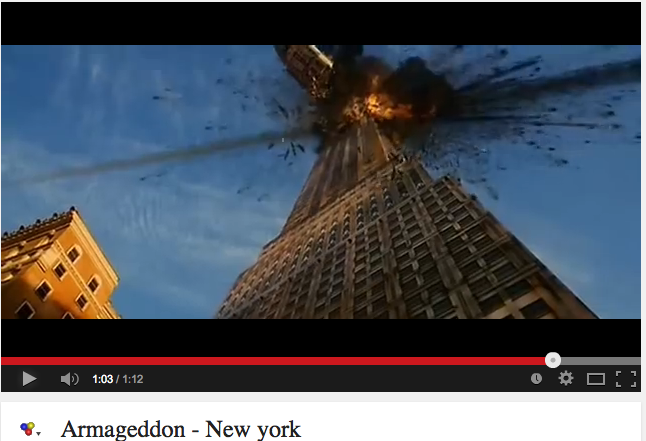 theorize that the 9/11 videos were completely animated, with errors (such as the "moving bridge"). 2. 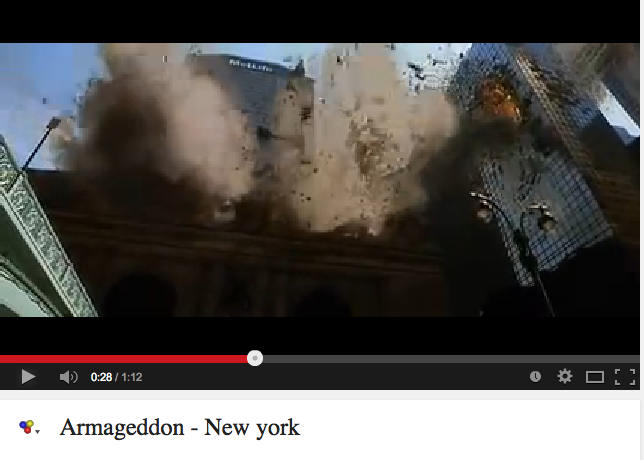 It is possible that the burning and demolition videos could be prepared in advance, like "Armageddon", by beginning with live action footage. To produce 1000 hours of FX shots might take a team of 500 people 10 years. There would undoubtedly be continuity errors, for example, in "painting in" revealed backgrounds behind now-missing buildings. 3. 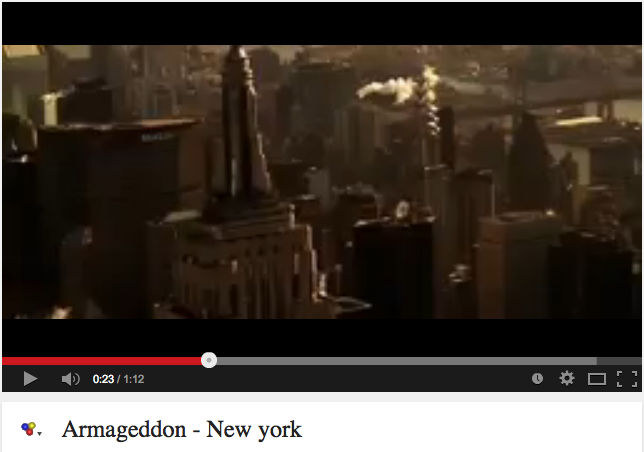 When people see a movie like "Armageddon", they know it is a movie, and do not expect the real New York City to be damaged. On 9/11, somehow the WTC was really destroyed. 4. If the composi-traitors could somehow overcome these problems, and for some reason actually wished to fake the demolition videos, and went to all that trouble, then surely they would have made them look like collapses. Point 3 is irrelevant as to whether the footage is genuine or not. No one argues that the towers were not demolished. Anonymous said :" Point 3 is irrelevant as to whether the footage is genuine or not. 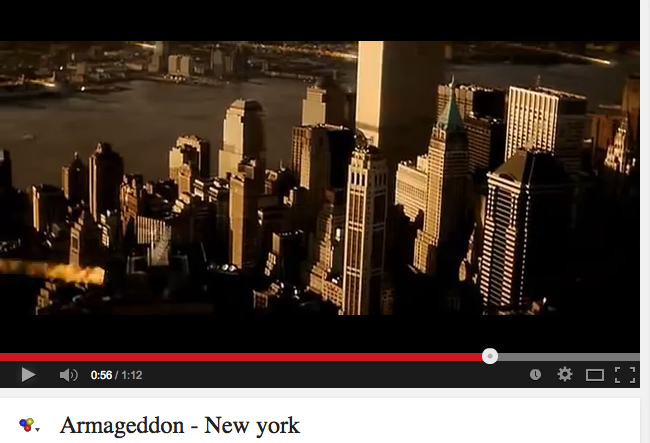 No one argues that the towers were not demolished." Because the towers fell, and because the videos show the towers falling, does not incontrovertibly "prove" that the videos showing those events are genuine. To believe so is a major logical error, I believe. Instead, regardless of what the video footage shows, that same [collapse] footage has to be closely analyzed for signs of fakery. Only then can a determination of authenticity or not be made, and if a person has no idea what to look for in the first place [eg Fetzer, Baker, Reynolds, Kalezov, Hall, Wood , Griffin, etc. ], then they have no business claiming the videos to be authentic in the first place, as they all unfailingly do, to this day. maybe one of these debunkers also has a video showing an airplane hitting bldg seven?!? It should be Ace Baker Ventura. Or simply Ace Ventura. Mr. Baker nailed the Fake Planes to a T.
It's undeniable that no planes were involved. Undeniable those buildings did not crumble without controlled Demolition.